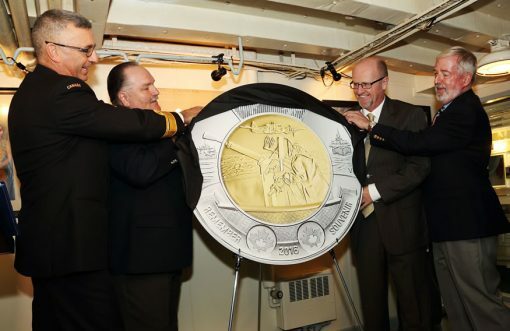 Earlier today, Oct. 20, the Royal Canadian Mint unveiled a $2 circulation coin that commemorates the 75th anniversary of the Battle of the Atlantic. A ceremony for the coin’s release was held aboard the HMCS Sackville, the last of 123 Canadian corvettes to sail in the Second World War. 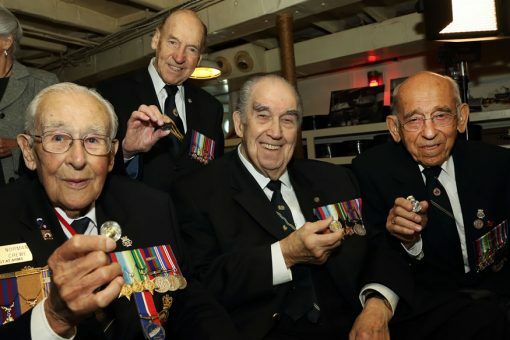 Several veterans of the battle attended the event, including Norman Crewe (Canadian Merchant Navy), Captain Angus McDonald (British Merchant Navy), J. Vernon Toole (Royal Canadian Navy) and Captain Earle Wagner (Canadian Merchant Navy). 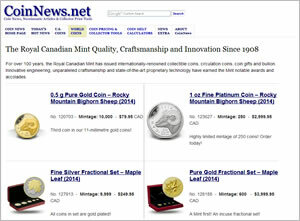 "The Mint is privileged to be able to use its coins to share the inspiring stories of our veterans’ selfless defense of our values," said Sandra Hanington, President and CEO of the Royal Canadian Mint. "Our new two-dollar circulation coin is giving millions of Canadians yet another story worth holding onto as we remember how our veterans, in the armed forces and the merchant navy, helped win the Battle of the Atlantic." The coin’s reverse (tails side) shows a center golden image of a watchful sailor pressing his eye to the viewfinder of his anti-aircraft gun, scanning the skies for threats. A Bristol Beaufighter flies overhead. The central image is accompanied by the depiction of two other Canadian vessels in the distance, traveling unforgiving seas. Above and below the central ring is a pair of maple leaves. The reverse is the work of Canadian maritime artist Yves Bérubé. Reverse inscriptions include REMEMBER, 2016, SOUVENIR, and YB for the Bérubé’s initials. Obverses feature the Susanna Blunt effigy of Queen Elizabeth II with inscriptions of ELIZABETH II, D G REGINA, CANADA, and 2 DOLLARS. 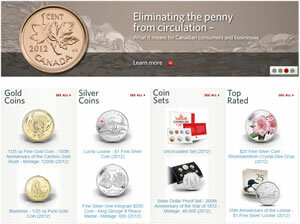 Limited to a mintage of 5 million, the $2 commemorative will be available in general circulation. It is also sold in a sealed pack of five coins for $10. The packs have limits of 75,000 with 3 per household, and are available only to Canadian residents. 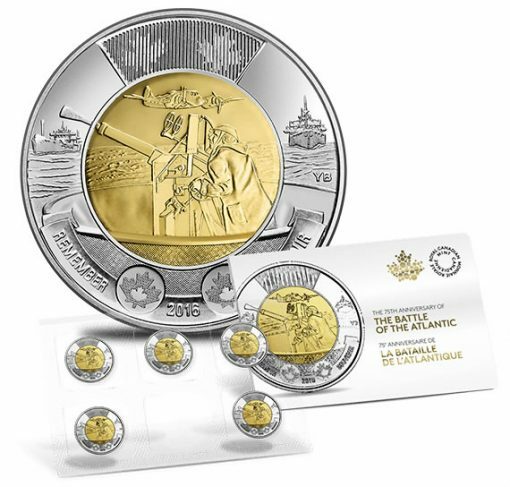 Buy packs of 75th Anniversary 2016 $2 Battle of the Atlantic Coins from the Royal Canadian Mint at www.mint.ca/battleatlantic.